Well, the Chile 2013 adventure is nearly over and just to rub it in I’m staying at another big business hotel 1 km from Santiago Airport, using a 30% discount voucher from the 2013 Copec Map book. But don’t get too excited – it was already cheaper on the internet and the discount could only be claimed from the desk price – another ‘fake deal’ that I will expose on various review sites when I get back. The temperature outside as I went to collect the main luggage from the car – one of the rare occasions that the bag has left the car. I believe that I can still travel lighter. Next Spring I might test that. Just a matter of leaving home what ever I brought along this time and didn’t use. I worked out that I would just about make it back with the money and fuel that I had, but then the doubts set in – how much were the tolls? It was very tight! So as I preach to reduce stress by exchanging uncertainty for certainty, I decided to drive north on R5 from Pichidangui to use the cash point at the Copec / Pronto. I had seen one near the banjos when Angie and I first stopped there in October. So it came as a bit of a shock when it turned out that in the mean time it had been replaced by a Christmas display and a gaming machine. I carried on to the next retorno at (another) Totorolillo, this one was my first cactus stop along R5 during the Chile 2001 trip and was a popular early stop again in 2003. By 2004 signs of change were clear and by 2006 there was a guarded gate across the track stopping us from inspecting the cactus friends that we had photographed along this stretch. 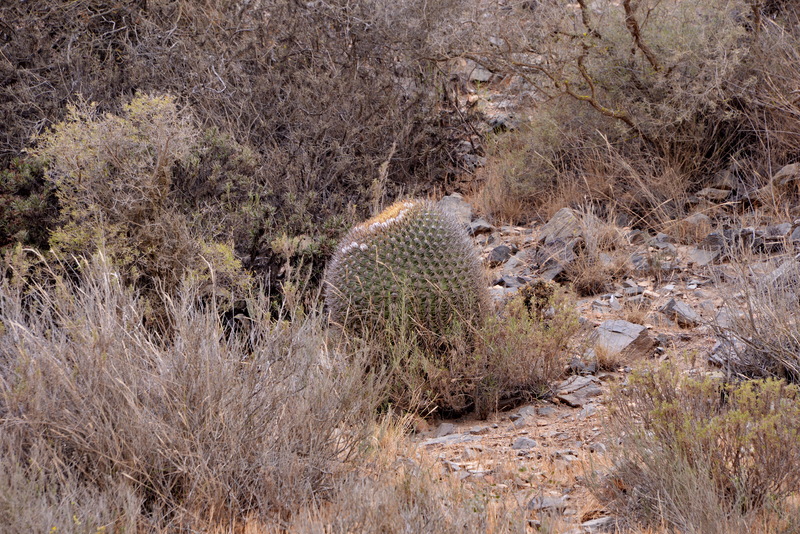 Since then we have driven past in disgust – another site lost to cactus tourism due to human development. Today my intention was only to turn round and head south, but I did notice that the gate and guard had gone – may be moved farther back to the small harbour, or may be the gate was just needed when there was so much building going on so that materials needed to be protected. Perhaps a quick look on a future occasion? I wonder how the small seedlings photographed in 2003 and 2004 in a crack in a rock have reached maturity yet. For now I was keen to check out the availability of money at the west side of R5 and fortunately it was. Angie had already spotted some potential souvenirs for me to buy at the Airport – more Chilean cups etc. so I took out enough and added an extra 5.000 pesos of fuel to the car – I gather that fuel went up today to about £1 per litre. When I got to the tunnel at El Melon, impulse made me take the scenic route over the hill; after all I had enough fuel now. It turned out to be a very scenic drive, excellent road surface zig-zagging up the hill and down the other side, a mere 10 minutes or so and saving 7.600 pesos on toll. Might do it again in nice sunny weather, with time on my side. I arrived at the hotel two minutes after the 14:00 hrs earliest check in time and will stay until a few minutes before the noon kick out time tomorrow to get maximum value for money. Once at the airport I’m meeting Florencia to help me break the time for the flight at 21:00 hrs or there about. I expect the next episode of the Diaries to be written from home in Amesbury announcing safe arrival sometime on Saturday. It was another fun trip and I’ll probably visit Chile again in future – 2015 seems the earliest date available although South Africa is also pencilled in for that year. Aahhrrgghh – choices! We all know that I should have headed south along R5, in the direction of Santiago, but something had been niggling me about yesterday’s Eulychnia – I had seen those strange hypanthia before. Then it came to me – at Totorallilo, a small posh seaside resort south of Coquimbo in 2008 (?) when Cliff & I stayed on to help Juan & Flo host Steve Frieze and his wife from California. 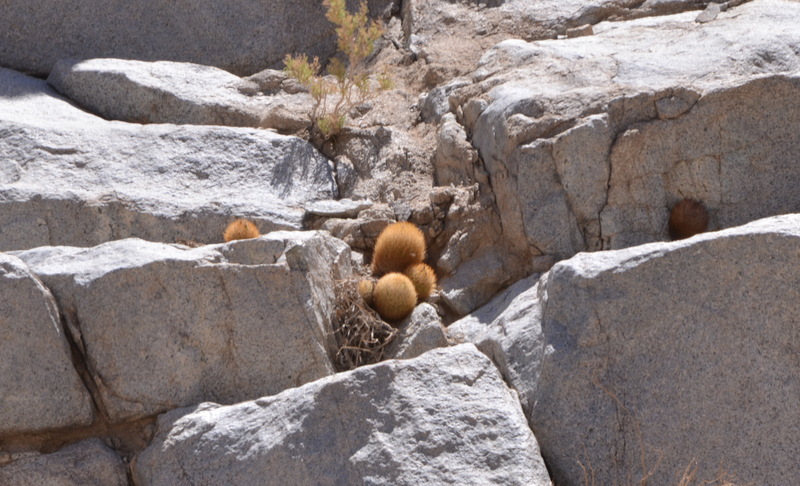 We spent a day here and after a nice lunch (I believe Juan & Flo spotted a TV personality amongst the guests in the restaurant) we climbed the rocks next to the car park and found these Eulychnia as well as Copiapoa coquimbana and some Eriosyce. Ian commented in private that I had not reported seeing many Eriosyce on this trip and while were were not particularly looking for them, that is certainly true. Many that I did see were photographed and recorded as ‘Eriosyce sp.’ as there is no point at me guessing their name – Juan knows them much better and I can look up the names he suggested in the past once I get home. Things had changed a little here as well. The facilities looked much posher from a distance – they wanted $3.000 for me to take a closer look, but I was not that keen. The car park was now high security, surrounded by a fence, so there was no getting to our earlier spot easily. But I found some space higher up the hill and found the Eulychnia without problem, and accessible! 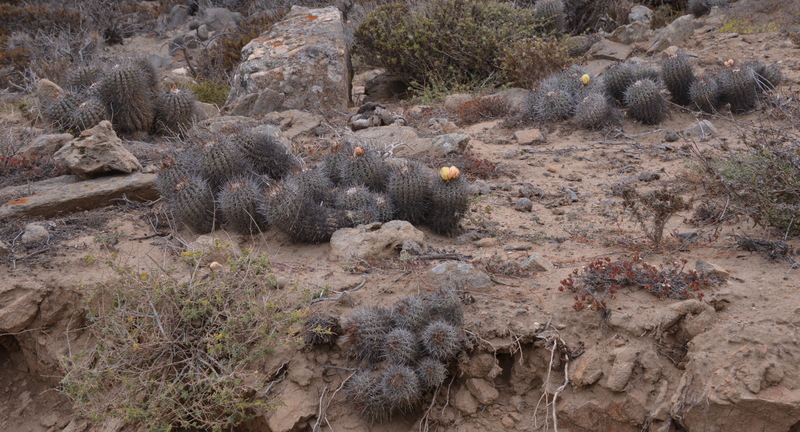 But the ground had been well-trampled by the cheaper beach holiday crowds, so there were no ‘small’ cacti such as Copiapoa and Eriosyce during the 30 minutes that I allowed myself. I happily snapped away at the Eulychnia that indeed had a similar ‘halfway stage hypanthium’ spotted yesterday at Playa Blanca. Not that surprising, as across the bay I could see the outline of the hill which has Guanaqueros at its foot and Playa Blanca is just on the other side. So it could be a micro-environment feature? But wait a minute! Yesterday’s plants had their flowering laterally down the stem – an E. acida feature, but here all flowering appeared at or near the Apex – a E. breviflora feature. Yesterday’s plants showed no sign of differential spination – the horse hair-like spines on stems that had flowered before, but here they did! Another change from E. acida to E. breviflora features. I wish I had stayed away but also know that this would have niggled me all the time until another visit – earliest possibly in 2015! A long time to be niggled! The distribution for E. breviflora ‘tambilloensis’ now covers an area from Playa Blanca in the south, along the coast to Totoralillo and inland to Tambolillo. I guess that a future trip to Chile will involve another stop at Guanaqueros for more Eulychnia spotting. I’ll line this years images and information up with what I have already and present it as ‘Unanswered questions’ to those who might know. 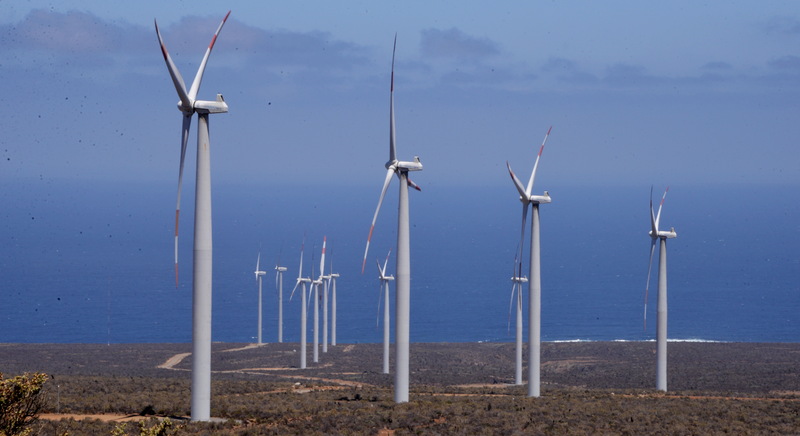 With still plenty of time left for a leisurely drive along R5, I pulled in at the ‘ecology mirador’ at one of the wind turbine farms. Found lots of info about the size of these giants and their output and made some videos and pictures without having to try to do so while steering a car at 120 km.p.hr. 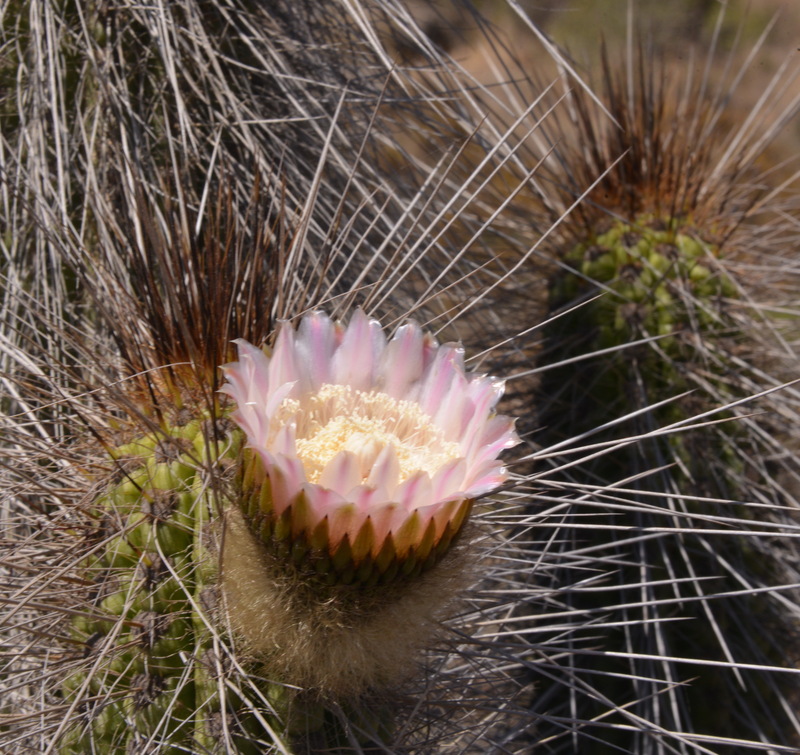 The blurb claims that the farms protect cacti and other endangered species from other human development, and I’m sure that they are right, but again – will they allow us access to admire and photograph them. Or will they be so well protected that they’ll spill over from the protected area in time to come? Or will the turbulence experienced near the masts be detrimental to the plants and just leave bare patches of soil to be blown away? Only time will tell. During the early planning stages of my first three weeks with Angie, combining Chile and Argentina, one plan had been to do Patagonia first and then head north in Argentina crossing from San Juan Province via Paso de Agua Negra into the Elqui Valley, with a convenient first night in Vicuña. Several things went wrong with the plan, first of all, Alamo’s inability to provide papers to take the car into Argentina on the day that we arrived, necessitating a second journey to Santiago Airport and secondly, the fact that the pass is closed until 1 November, due to inclement weather (snow & Ice). A trip up the Elqui Valley had then been on the programme for Jonathan and I, but this was thwarted by the problems with car #2, so, now towards the end of my stay it seemed to be a good idea to take a look at El Indio, about as far as you can go before leaving Chile. A drive through the valley, especially the bit past Vicuña is always enjoyable with some wonderful sight of a mountainous desert that yet finds a means to produce mile after mile of grapes. During previous visits we saw the last end of the road being built, watching diggers move the result of blowing yet another piece of mountain up and bouncing over the same rocks in what was supposed to be a track. Then in 2010 we found a wonderful asphalt road providing a smooth and fast route to the border. At the border a track veers off to the left and leads to a mine, El Indio, although the actual track is blocked by a chain, some 30 km from the border post. It certainly helps to have extra pairs of eyes scouting along the hillside while the driver concentrates on the road. And that was certainly necessary, as there was fresh rubble on the road, not unlike when we had driven into Tocopilla, the day of the earthquake there. As I seemed to be the only user of the road, I could understand the lack of urgency in cleaning up such spills, or were they in fact fresh today? Usually we have made this trip after an overnight stay in Vicuña, returning there for another night, but doing this from Guanaqueros added another dimension of urgency to the journey. SatNav reassured me that I was OK time wise, as long as I did not doodle. At the border post, there now was a large No Entry sign at the start of the track to El Indio – manned by two security guards. I decided to take a look at the border post itself. ‘Anyone speak English? Is the border open?’ ‘No’ was the all encompassing reply. Clearly the officers on duty had not kept awake during their English classes. Help came from a French couple who had cycled up. I told them that I had suspected that they were Europeans, we’re the only folk mad enough to get to these wild and lonely places. They explained that the border was still closed as the glacier that runs across it had not yet molten enough this year. The temperature at the border office was 26 C but higher up it was still around freezing. They had been allowed through on their bikes as far as they could go – there was no chance of them completing the crossing. At the glacier they met a scientist who was studying the glacier who took them all the way to the top for some incredible views – but I was due back on the coast tonight – no time for that adventure! The sun was a bit kinder on the way back, picking out the ‘golden tennis balls’ in inaccessible places high on the hills. The spots that I remembered from previous trips had gone – the areas along the side of the road continue to be widened, to reduce the debris of stones (some half the size of a small car!) rolling down the hill, so the wider the landing zone alongside the asphalt, the better, at the expense of the cacti that grew there. I still managed a few nice shots, so it was not a cactus less day by any means. The other surprise came as I passed the Embalsa Puclaro, the huge reservoir that has always been a good indicator of moisture – it was practically empty! There was some water going back a double of 100 m. from the base of the dam. I’ve had a quick look but apart from studies predicting lack of water reaching crisis points, there is no current update. You may remember that Angie & I had seen a similar story in the Qualimari Valley, near Pichidangui, where the reservoir was bone dry! Had the dams leaked? Damaged by earthquakes? Too much water used for irrigating the endless vineyards or just not enough meltwater becoming available to satisfy demand? 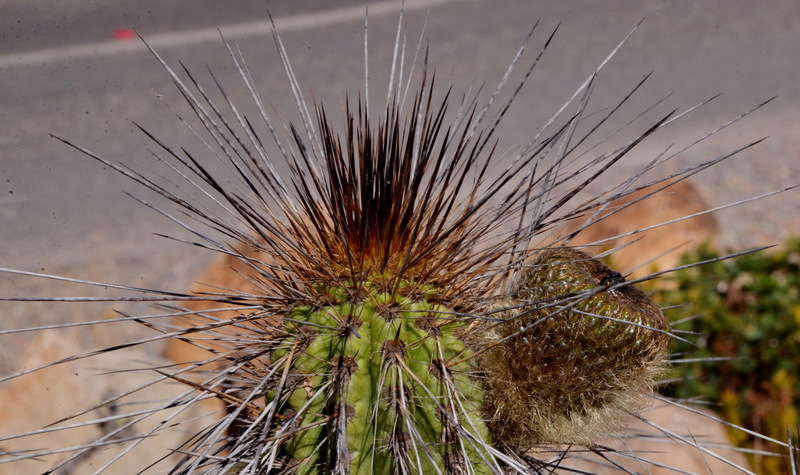 Perhaps the cacti will get their revenge, but it might be an idea to stock up on Chilean wine! Just in case! It seems that a larger reservoir was created higher up in the mountains, away from roads to enable irrigation for vineyards to succeed above the original reserves’ altitude – more detective work needed. 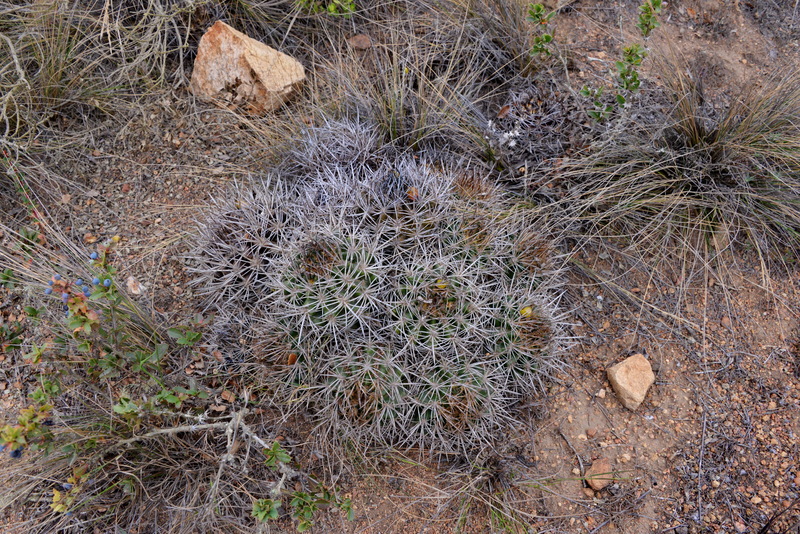 So an interesting day, even if I did not add a massive amount to my cactus images. There will be another day tomorrow. When I left, the plan had been to go back to the track to El Sauce, some 11 km before the National Park entrance. With only 11 km to the entrance and this being a Sunday, I thought it was worth a look to see if the Park was open for a change. And guess what! Gate open and ranger ready to take my money. 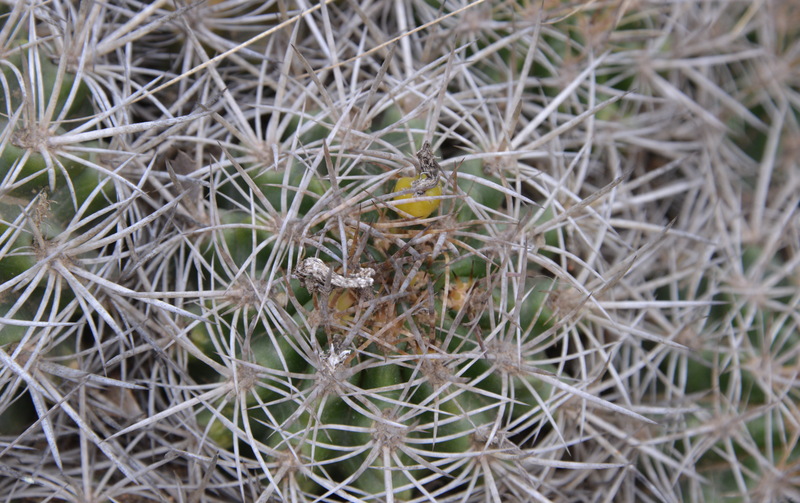 ‘Were there any cacti in the park? Copiapoa?’ he had reached the end of his English knowledge and while he gave me an English description of the park (to be returned at the exit and not that informative – just Health & Safety stuff, what to do in case of sudden fog (sit tight) and of forest fires (get the hell out). So it was a case of follow the track, visit the visitors centre and take pictures for all the displays, for all of you who have been faced by shut gates in the past. It seemed that the visitors centre was completely different to the one we visited briefly in 2003 (?) when time budgets stopped a longer visit – Fray Jorge is one of those places that you tend to pass on the way up from Santiago or on the way back south, just long enough for a cactus fix along the track on the way in, but never long enough to do the full visit. I did spot a lone mega large E. aurata on the hillside near the entrance (still outside) (S2963). Once inside the park I pulled in near the top of the hill (S2965) to take some more images and video of the camanchaca doing its thing, when on the ground, almost next to the car, I spotted several globular cacti – Eriosyce sp – whatever grows here, plus one clumping plant that looked different, may be C. coquimbana, although the fruit looked wrong. No hairs on the fruit, so not sure if it can be an Eriosyce either. One or the other I guess. On the way back I took the Tongoy exit off R5 and took some more images of the hotels that have ruined the coastline here. That’s why I love Guanaqueros that still has a ‘1960s small seaside resort’ feel, even if that means sitting on a chair in the sun next to the office, while a yank is hovering around waiting for ‘my’ seat to become free, just to get a wifi signal..